You can now have a solar powered gate. Being green is no longer just about recycling waste. The electric gate market now gives you the option of an automatic solar powered gate. Solar power technology can be used for all types of gate automation. There are no restrictions. Therefore, sliding and swing automation including underground operators and boom gate operators are all able to be powered by. solar panels. This includes all residential, industrial and commercial applications. Our solar powered automatic gates will service your needs. Imagine being able to stay in your car to open your gate. The system works automatically within a few seconds. Allowing you to enter or leave your property quickly. In addition, Nice gate openers guarantee a reliable and secure protection of your property. They provide additional security features that safeguard against potential intruders. A reliable solution that you can count on! Very Nice to come home to. 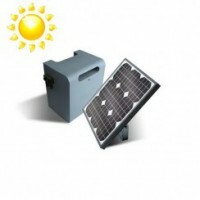 Nice Solemyo is the kit for solar power for automation of gates, garage doors and barrier gates, including those located far from the power mains. Being green isn’t only about recycling your waste. The modern day electric gate market has made great leaps within solar power gate industry.